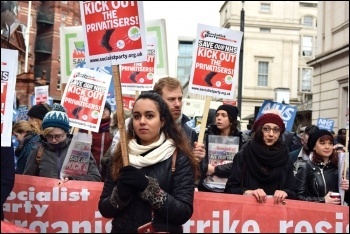 Around 80 Unite the Union pickets made their voices heard on the first day of strike action against York Teaching Hospital NHS Foundation Trust transferring cleaners, caterers, domestics, estates and other ancillary staff into a 'wholly owned subsidiary' - a step towards privatisation. The two-day action on 27-28 September was determined, with many workers outraged that yet again in the NHS it was the lowest paid who were being forced to bear the burden of Tory cuts. Socialist Party members have been at the forefront of the campaign in the city against these proposals, establishing a broader campaign against them, and gathering thousands of petition signatures against the proposals. On the picket line, Unite shop steward and Socialist Party member Mal Richardson introduced a strike rally with speakers including local Labour MP Rachel Maskell, Unite reps, local campaigners and a speaker from the National Shop Stewards Network, which Unite has recently affiliated to. Workers are determined to take further strike action if necessary to reverse this decision and stay "100% NHS". The best way to force a change is escalating the action, as has been demonstrated by successful strikes against wholly owned subsidiaries in Wigan as well as the threat of strike action by public service union Unison in Mid Yorkshire Trust and Tees, Esk and Wear Valley Trust, with the latter two led by Socialist Party members.